Mississippi State University is flying high for two reasons. 2. The school’s Raspet Flight Research Laboratory has acquired two TigerShark XP3 drones. 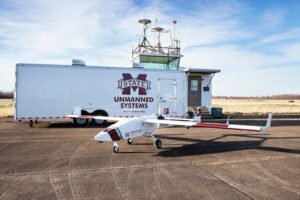 Built by NAVMAR Applied Sciences Corporation, the drones cost about $2 million and MSU obtained federal research grants to cover most of the cost. The TigerShark is designed for reconnaissance and surveillance missions. It has a wingspan of 22 feet, weighs 500 pounds, has a payload capacity of 100 pounds, and a flight duration of 10 hours. The school works with the Federal Emergency Management Agency and the Mississippi Emergency Management Agency to study the best ways to deploy drones for disaster response. The research center also works with local agencies across the Mississippi Delta to support civic and public safety missions as well as agricultural and environmental work. “Our partnership with MSU’s Geosystems Research Institute supports UAS-based research that monitors crop health, monitors trends and looks at broad areas of crop distress and potential causes,” Brooks said. “It can also look at changes to the environment, things like beach erosion and infestation of invasive species. So much that we do here is focused on the core needs of Mississippi and that is where we are at our best. *Note: This reporter is a native of Knoxville, Tenn. – GO VOLS! Sorry, MSU!